Over Christmas this year... uh last year now, I guess... my plan was to read only Christmas related books; specifically Christmas murder mysteries. I had about 6 books lined up – but the holidays got in the way, and I actually only finished one before the New Year. However, since we had a pretty bad storm here last night and I still have my Christmas decorations up, I figure I can still get away with reading a couple. 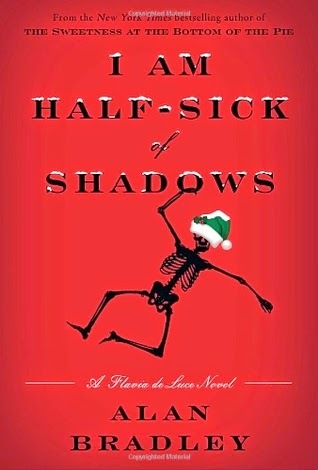 One of the ones that I was most excited about was I am Half-Sick of Shadows by Alan Bradley. This is the 4th book in a series about Flavia de Luce, a poison obsessed 11 year old girl who solves murders in her spare time. I had been hearing about the first book in this series, The Sweetness at the Bottom of the Pie, for a while before picking up an omnibus of the first three books. I enjoyed the first one, but I wasn’t in love with it. It seemed strange to me that an 11 year old would have so much knowledge – I was ready to be annoyed – but by the second one, I was hooked! Flavia lives in Bishop’s Lacey, a small British village in the early 1950s. She lives in Buckshaw, a huge rambling estate, with her father, her 2 terrible sisters, the cook and her father’s man Dogger. The estate was her mothers, who disappeared years earlier and is presumed dead – unfortunately there was no will and so now her father is struggling to make ends meet and keep the house. And that is where our installment of Flavia’s life begins. Her father has rented out the estate to a film company and some of the most famous actors are making their way into town. The famous Phyllis Whyvern and the local vicar have set up a charity show that happens to coincide with a terrible snowstorm and all of the villagers end up snowed in at Buckshaw. While everyone is asleep strewn about the house, Flavia wanders around and of course… finds a body! True to form of the way this blog is going, the mid-point occurs right after Flavia has found the body, so that’s where I am now! It’s funny how the reason that I wasn’t sure I was going to like these books has ended up being one of the reasons that I love them the most. Is it believable that an 11 year old would know more about Chemistry than most people who have studied it their whole adult lives? Nope. Not at all. Not one tiny little bit. Luckily it doesn’t matter, cause Flavia’s pretty awesome. She has taught herself chemistry from books that she found belonging to her great uncle Tarquin and spends most of her time making mischief. Currently she is concocting a method to trap Santa Claus, while taking some breaks to think of ways to deviously destroy her sisters. I think that this is one of the reasons that Flavia works so well as a character; she flits between being a lonely 11 year old girl, and a brilliant, world dominating genius. It’s brilliant! Flavia’s precociousness is not the only reason to love these books; every character has distinct personalities and characteristics, and even if they only have small parts they are all fully realized. Flavia’s father Haviland is a detached man who seems to only have time for his stamps – but is really in deep mourning for his wife and can be often found sitting in her car in the garage. Dogger, who fought with Haviland in the war, but came back not altogether there. He has a fount of knowledge that helps Flavia quite a bit with her murder investigations, but we’re a little concerned about how he gained it. Opehlia and Daphne, Flavia’s sisters, while horrible, are not quite as horrible as Flavia thinks they are… although they are still pretty horrible. And then we have all the supporting characters, Mrs. Mullet the cook who can’t cook anything edible, Dieter the German prisoner of war who decided to stay in Bishop’s Lacey after the war, who is also in love with Ophelia, and Ned, the potboy at the local hostelry (who is also in love with Ophelia) and Mary, the landlord’s daughter (who happens to be in love with Ned). Bishop’s Lacey is the perfect small English town, with all of the appropriate characters. This is not a small part of my enjoyment of this series! The mysteries themselves are pretty good too. Each story focuses on a group of villagers and introduces us to their back stories and their secrets, and I haven’t been able to guess any of the culprits so far! I think a perfect tea for reading this is David's Eggnog caffeine free rooibos. Its a winter limited edition so try to get some soon! I think its the perfect way to curl up with a good Christmas murder mystery and a little eggnog in your eggnog tea.